California has a number of distinct desert zones, ranging from Death Valley in Inyo County to the Mohave Desert around I-15 and I-40 along the route to Las Vegas and Northern Arizona to the Anza-Borrego Desert east of San Diego. My friend Bill also tells me about the Carrizo Plain National Monument, which also seems to be a desert, one which I have not yet visited. And undoubtedly there are several I am not taking into account. One thing they all have in common: Don’t go there in the summer if you don’t want to die of discomfort and have your car stranded on some obscure untraveled highway. In the winter, on the other hand, the desert is lovely and beguiling. 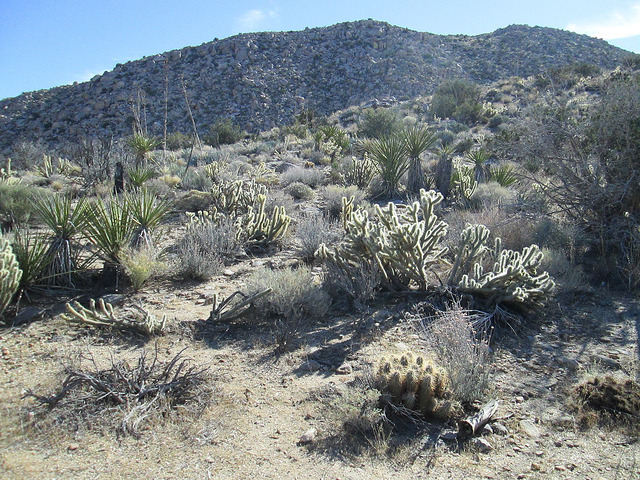 Do you see those cholla cactuses in the center of the above photo? When the sun shines through their barbed needles, they look positively huggable. But don’t even try! If you brush against cholla spines, they will stick to your skin and your clothing, and you will have the devil’s own time disposing of them. During the spring, you are likely to see that every inch of the rough desert surface seems to be covered with tiny wildflowers. The efflorescence lasts only a few weeks, and you have to time your visit carefully and call locals to see if it’s happened yet. And it generally happens only after a wet rainy season. We haven’t had many of those lately. Because California is on the ring of fire, you can occasionally find natural hot springs in which you can bathe. There is one such in Anza-Borrego on County Road S-2 south of Scissors Crossing. To get there, one passes by the old Butterfield Stage Route; and you can even stop at one of the Butterfield Stage stations which has been restored to its 19th century glory. When it’s too cold to go the beach, consider the desert.